Kokopelli is a Native American deity known for playing the flute and having fun. Sounds like my kind of deity. Little-known-fact: Kokopelli also thoroughly enjoyed birding! 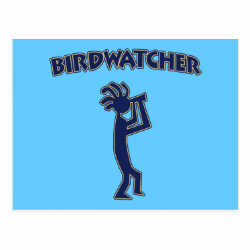 This is a fun original design for all birdwatchers -- as long as they also like to have fun.